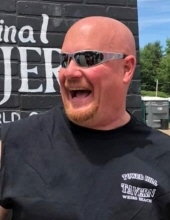 JEFFERSON – Jeffrey R. Smith, 50, of Crow Road, died suddenly and unexpectedly while working in Berlin on Saturday, March 16, 2019. Surviving family members include his wife Michelle (Streeter) Smith of Jefferson; his mother Betty Smith of Jefferson; his daughter Samantha Smith of Derby, VT; his step-children Zackery Martin and Hayleigh Gonyer of Jefferson; two brothers, Bruce Simmons of California and Philip L Smith Jr.; and a sister Tanya Foster of Littleton. He was predeceased by his father Philip Sr.
A celebration of life will be held at his home at a later date. "Email Address" would like to share the life celebration of Jeffrey R. Smith. Click on the "link" to go to share a favorite memory or leave a condolence message for the family.